Santa Claus, also known as Saint Nicholas, Father Christmas, Kris Kringle, or simply "Santa," is the mythical figure who, in most of Western cultures, brings gifts on Christmas Eve. 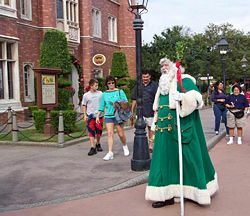 The legend of Santa Claus is based in part on the historical figure of Saint Nicholas of Myra, as well as on Norse myths associated with the god Odin, and American commercial culture. 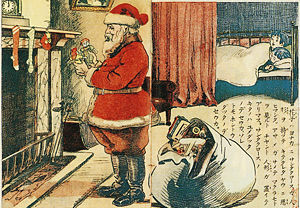 The modern depiction of Santa Claus as a plump, jolly man wearing a red coat and trousers with white fur cuffs and collar became popular in the United States in the nineteenth century due to the publication of the poem The Night Before Christmas and the influence of caricaturist Thomas Nast. This image has been maintained and reinforced through song, radio, television, films, and the commercial success of Christmas shopping. 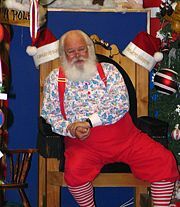 The American version of Santa Claus lives at the North Pole, where he lives with Mrs. Claus. The European Father Christmas is said to reside in Lapland or other northern countries. Santa makes a list of children throughout the world, categorizing them according to their behavior: naughty or nice. He delivers presents, including toys, candy, and other gifts to all of the good boys and girls in the world, and sometimes coal or sticks to the naughty children. He accomplishes this feat with the aid of magical elves who make the toys, and eight to ten flying reindeer who pull his sleigh. There has long been opposition to teaching children to believe in Santa Claus. Some Christians say the Santa tradition detracts from the religious meaning of Christmas, while other critics feel that the Santa Claus myth constitutes an elaborate lie unethically told to children by their parents. Defenders insist that believing in Santa is a harmless and joyous tradition which brings families together, and that he symbolizes a tradition of unselfish giving much in character with the spirit of Christmas. French girls with "Saint Nicholas"
Saint Nicholas of Myra is the primary inspiration for the Christian figure of Santa Claus. He was a fourth-century Greek Christian bishop of Myra in Lycia, a province of the Byzantine Anatolia, now in Turkey. Nicholas was famous for his generous gifts to the poor, in particular presenting the three impoverished daughters of a pious Christian with dowries to prevent them from falling into a life of prostitution. In Europe (more precisely the Netherlands, Belgium, Austria, and Germany) he is still portrayed as a bearded bishop in canonical robes. Saint Nicholas became a patron saint of many diverse groups, from archers and children to pawnbrokers. In many regions of Austria and northern Italy, children are given sweets and gifts on Saint Nicholas' Day (San Niccolò in Italian), in accordance with the Catholic calendar, December 6. 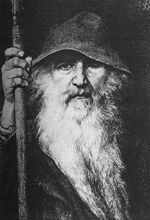 Numerous parallels have been drawn between Santa Claus and the figure of Odin, a major god among the Germanic peoples prior to their Christianization. Two thirteenth century books from Iceland, Prose Edda by Snorri Sturluson and Poetic Edda compiled from earlier sources, describe Odin as riding an eight-legged horse named Sleipnir that could leap great distances, giving rise to comparisons to Santa Claus's reindeer. Children would place their boots, filled with carrots, straw, or sugar, near the chimney for Odin's flying horse to eat. Odin would then reward those children for their kindness by replacing Sleipnir's food with gifts or candy. This practice survived in Germany, Belgium, and the Netherlands after the adoption of Christianity and became associated with Saint Nicholas as a result of the process of Christianization. The modern practice of the hanging of stockings at the chimney in some homes may have derived from this tradition. Numerous other influences from the pre-Christian Germanic winter celebrations have continued into modern Christmas celebrations such as the Christmas ham, Yule logs, and the Christmas tree. There are various explanations of the origins of Santa's helpers, nowadays depicted as friendly elves. In the Netherlands and Belgium, Saint Nicolas is aided by a helper or helpers known as Zwarte Piet ("Black Peter"). Another theory is that the helpers symbolize the two ravens Hugin and Munin who acted as Odin's spies. In later stories the helper represented the conquered Devil, who was defeated either by Odin or his assistant Nörwi, the black father of the night. Nörwi is usually depicted with the same birch staff as Zwarte Piet. A Christianized version of the story is that Saint Nicolas liberated an Ethiopian slave boy called "Piter" from a Myra market, and the boy was so grateful that he decided to stay with Nicolas as his servant. The pre-Christian Alpine figure of the Krampus—a frightening, horned and clawed incubus—also evolved into a companion of Saint Nicholas. Traditionally, young men dress up as the Krampus in the first two weeks of December and roam the streets frightening children (and adults) with rusty chains and bells. The character of Father Christmas dates back at least as far as the seventeenth century in Britain and is also found in other European countries. Pictures of him survive from that era, portraying him as a well-nourished bearded man dressed in a long, green, fur-lined robe. He typified the spirit of good cheer at Christmas, and was reflected in the "Ghost of Christmas Present" in Charles Dickens's A Christmas Carol. 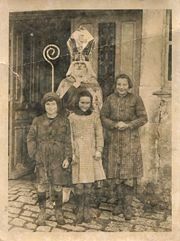 The figure of Saint Nicholas was also blended with local folklore. In Nordic countries the original bringer of gifts at Christmas time was the Yule Goat, a somewhat startling figure with horns. An elf from Nordic folklore called the "Tomte" became the person who delivers the Christmas presents in Denmark beginning in the 1840s. The Tomte was portrayed as a short, bearded man dressed in gray clothes and a red hat. This new version of the age-old folkloric creature was inspired by existing Santa Claus traditions that were then spreading to Scandinavia. By the end of the nineteenth century, this tradition of an elf bringing Christmas presents had also spread to Norway Finland, and Sweden, replacing the Yule Goat. In Finland, however, the more human figure retained the Yule Goat name. A straw goat is still a common Christmas decoration in all of Scandinavia. In the British colonies of North America and later the United States, British and Dutch versions of the gift-giver merged further. For example, in Washington Irving's History of New York, (1809), Sinterklaas was Americanized into "Santa Claus" but lost his bishop's apparel. He was at first pictured as a thick-bellied Dutch sailor with a pipe in a green winter coat. The modern ideas of Santa Claus emerged more clearly after the publication of the poem A Visit From St. Nicholas (better known today as The Night Before Christmas) in the Troy, New York, Sentinel on December 23, 1823. Originally published anonymously, the poem was later attributed to Clement Clarke Moore. In this poem Santa is established as a heavyset elf with eight reindeer, who are named here for the first time. One of the first artists to define Santa Claus's modern image was Thomas Nast, an American cartoonist of the nineteenth century. 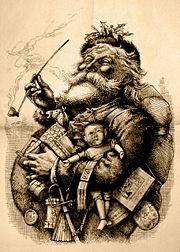 In 1863, a picture of Santa illustrated by Nast appeared in Harper's Weekly. In 1889, the poet Katherine Lee Bates created a wife for Santa, Mrs. Claus, in the poem "Goody Santa Claus on a Sleigh Ride." L. Frank Baum's The Life and Adventures of Santa Claus, a 1902 children's book, further popularized Santa Claus. Baum gave his "Neclaus" a home in the Laughing Valley of Hohaho and ten reindeer which could not actually fly, but leaped in enormous, flight-like bounds. This work also established Claus' motives: a happy childhood among immortals. When Ak, Master Woodsman of the World, exposed him to the misery and poverty of children in the outside world, Santa determined to find a way to bring joy into the lives of all children, and eventually invented toys as a principal means. In some images of the early twentieth century, Santa was depicted as personally making his toys by hand in a small workshop like a craftsman. Eventually, the idea emerged that he had numerous elves responsible for making the toys, but the toys were still handmade by each individual elf working in the traditional manner. Santa living in the North Pole emerged after a group of Sami people moved from Finnmark in Norway to Alaska together with 500 reindeer in the late nineteenth century to teach the Inuit to herd reindeer. In 1926, Lomen and Company, which marketed reindeer meat, launched a commercial campaign in conjunction with the Macy's Department Stores in which the reindeer pulled sleds with Santa. Thus was born the American commercial Santa Claus, coming from the North Pole with his reindeer. Images of Santa Claus were further popularized through a depiction of him for The Coca-Cola Company's Christmas advertising in the 1930s. The popularity of the image spawned urban legends that Santa Claus was in fact invented by Coca-Cola or that Santa wears red and white because they are the Coca-Cola colors. In reality, Coca-Cola was not the first soft drink company to utilize the modern image of Santa Claus in its advertising – White Rock Beverages used Santa to sell mineral water in 1915 and also in advertisements for its ginger ale in 1923. The 1947 film, Miracle on 34th Street tells the story of what takes place in New York City following Macy's Thanksgiving Day Parade, as people are left wondering whether or not a department store Santa might be the real thing. There have been four remakes of the movie, as well as a Broadway musical. Among others, the film won an Academy Award for Edmund Gwenn for Best Supporting Actor for his portrayal of Kris Kringle. The concept of Santa Claus continues to inspire writers and artists, as in author Seabury Quinn's 1948 novel Roads, which draws from historical legends to tell the story of Santa and the origins of Christmas. Other modern additions to the "mythology" of Santa include Rudolph the Red-Nosed Reindeer, the ninth and lead reindeer immortalized in a Gene Autry song, written by a Montgomery Ward copywriter. The 1956 popular song by George Melachrino, "Mrs. Santa Claus," helped standardize and establish the character and role in the popular imagination. By the end of the twentieth century, Santa's North Pole residence was often humorously portrayed as a fully mechanized production and distribution facility, equipped with the latest manufacturing technology, and overseen by the elves with Santa and Mrs. Claus as executives and/or managers. NORAD, the joint Canadian-American military organization responsible for air defense, regularly reports tracking Santa Claus every year. Condemnation of Santa Claus originated among some Protestant groups of the sixteenth century. It was also prevalent among the Puritans of seventeenth-century England and America, who banned the holiday as either pagan or Roman Catholic. Following the English Civil War, under Oliver Cromwell's government, the celebration of Christmas was banned. 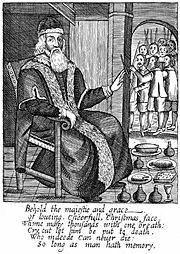 With the restoration of the monarchy and the Puritans out of power in England, the ban on Christmas was satirized in works such as Josiah King's The Examination and Tryal of Old Father Christmas; Together with his Clearing by the Jury (1686) [Nissenbaum, chap. 1]. Reverend Paul Nedergaard, a clergyman in Copenhagen, Denmark, attracted controversy in 1958 when he declared Santa to be a "pagan goblin" after Santa's image was used on fund-raising materials for a Danish welfare organization. One prominent religious group that refuses to recognize Santa Claus, or Christmas itself, for similar reasons is the Jehovah's Witnesses. The belief in Santa Claus by children is widespread. In an AP-AOL News poll, 86 percent of American adults believed in Santa as children, with the age of eight being the average for stopping to believe he is real, although 15 percent still believed after the age of ten. Parental and societal encouragement of this belief is not without controversy. Objections often center on the proposition that it is unethical for parents to lie to children without good cause, and also that children become seriously disillusioned when they discover that one of their most cherished beliefs was untrue. University of Texas at Austin psychology professor Jacqueline Woolley posits that the deception about Santa Claus constitutes a complicated series of very large lies. Writer Austin Cline posed the question: "Is it not possible that kids would find at least as much pleasure in knowing that parents are responsible for Christmas, not a supernatural stranger?" 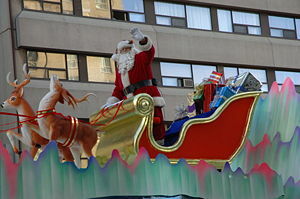 ↑ Calvin Woodward, AP Poll: Santa Claus Endures in America Washington Post, December 16, 2008. ↑ Austin Cline, Santa Claus: Should Parents Perpetuate the Santa Claus Myth? Retrieved December 16, 2008. "Yes, Virginia, There is a Santa Claus"newseum. This page was last modified on 18 August 2015, at 15:01.